Carlos Sainz keeps McLaren on top on Wednesday morning as Sebastian Vettel crashes out in his Ferrari. McLaren’s Carlos Sainz posted the fastest time of F1 pre-season so far on a disrupted morning of running in Barcelona as Sebastian Vettel crashed out in his Ferrari. 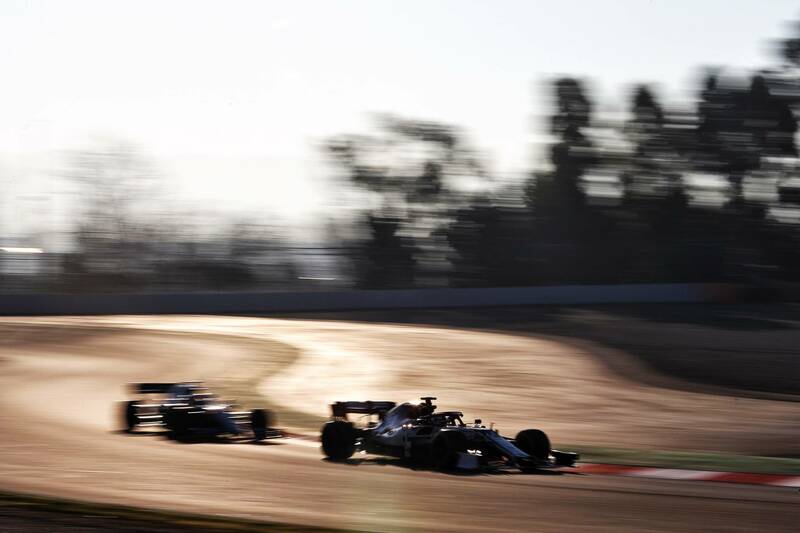 On the second morning of the second and final winter test ahead of the upcoming 2019 season, Sainz ensured McLaren carried on from where it left off on the opening day by topping the timesheets. The Spaniard’s 1m17.144s - set on Pirelli’s C4 compound - marked the quickest time seen in 2019 testing, beating Nico Hulkenberg’s previous benchmark of a 1m17.393s (C5) from the first test by over two tenths. Sainz’s time also bettered the fastest lap managed by Vettel during last year’s tests at the Circuit de Barcelona-Catalunya, despite concerns that the revised aero regulations brought in for 2019 would slow the cars down. A full second back from Sainz was Vettel, who racked up 40 laps of running for Ferrari before bringing out a lengthy pause to proceedings shortly after the two-hour mark when a mechanical failure caused him to go straight on at Turn 3. The yet unspecified issue sent the German spearing across the gravel and into the barriers at the long right-hander, with damage visible to the front-left of his Ferrari SF90 as it was removed from the scene. 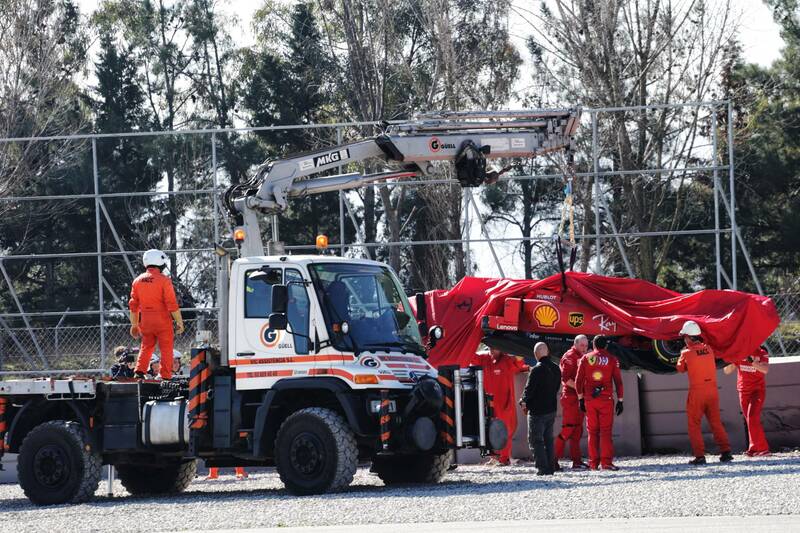 Vettel visited the medical centre as a precaution but Ferrari confirmed the four-time world champion was “fine” following the incident, which has left the Italian squad with work to do in order to get its car fixed in time for Charles Leclerc’s planned run this afternoon. The accident signalled the third red flag period of an action-packed morning, with Sainz grinding to a brief halt at pit exit after recording his best lap, while Max Verstappen suffered a similar stoppage in his Red Bull. Both drivers were able to rejoin the action shortly afterwards, with Verstappen posting the third-quickest time of the morning as he completed 69 laps. Valtteri Bottas returned to action for Mercedes after an oil leak truncated his running on Tuesday afternoon and foiled the team’s plans to analyse its updated aero package. The Finn, who was the first man to head out in the morning with the reigning world champions keen to make up for lost track time, logged the most laps of any driver (74) and finished fourth in the order, before he hands over to five-time world champion Lewis Hamilton following the lunch break. Daniil Kvyat was fifth-quickest for Toro Rosso, ahead of the Alfa Romeo’s Kimi Raikkonen. Sergio Perez ended the morning in seventh spot for Racing Point, just 0.008s shy of Raikkonen’s effort. A late improvement from Robert Kubica enabled the Williams driver to leapfrog Romain Grosjean's Haas into eighth place, with Daniel Ricciardo propping up the timesheets in 10th for Renault as he concentrated on race simulations - racking up over 70 laps. Running resumes at 2pm local time in Barcelona (1pm UK) for a further four hours.